Artificial intelligence (AI) has advanced exponentially in recent years. Many machines that consumers use daily now contain AI technology. It is also used in automotive industries to develop fully automated vehicles (FAVs), cars that people can use without having to drive. In many countries, automated driving technology has already been tested or used in public transportation systems and on highways. In Japan, companies such as Toyota and Nissan have tested their automated driving technologies on freeways and local roads. The Japanese government plans to introduce FAVs on selected roads by 2020, and it is likely that drivers will begin to see FAVs on ordinary roads sooner than expected (Managi 2018). Automated driving offers many benefits, including the reduction of both accidents and traffic congestion. For example, 96% of traffic accidents on freeways in Japan are due to human errors (mishandling, carelessness, and misjudgements by drivers). It is expected that automated driving technology will eliminate these accidents. Furthermore, almost 40% of Japanese drivers are elderly, and their mishandling of vehicles frequently causes fatal accidents. Financial loss from traffic congestion in Japan is estimated at approximately $10.4 billion. FAVs are expected to contribute significantly to reductions in road congestion. A study by Payre et al. (2014) is one of the few to have examined the factors affecting perceptions of automated driving technology. It found that consumers who owned cars with driving assistance systems, such as adaptive cruise control or a lane keeping system, were more likely to be positive about purchasing FAVs. As automated driving technology advances rapidly and receives more media coverage, consumers are increasingly exposed to this new technology and develop expectations. Policymakers are assisting with the investment in both hard and soft technologies related to automated driving. They are also preparing for the full introduction of FAVs in the consumer market and on public roads by debating optimal regulatory policies. Nonetheless, as with any technology, understanding consumer demand and perception is essential to predicting the near-future market and to grasping the barriers to the introduction of fully automated driving systems (FADs) as common consumer goods. Our study (Shin and Managi 2017) used an original individual survey that received 246,642 responses. On average, respondents anticipated that FAVs would be available for purchase in approximately 13 years. Figure 1 shows that approximately 12% of respondents answered that they would purchase FAVs or FADs, and 35% of respondents answered that they would consider purchasing. Source: Shin and Managi (2017). A near-majority of respondents were inclined to purchase FAVs or FADs, but approximately 20% of respondents answered that they would not purchase these technologies, and 32% of respondents answered that they did not know whether they would purchase. One of the reasons for this large agnostic group may be lack of interest and information about AD technology. 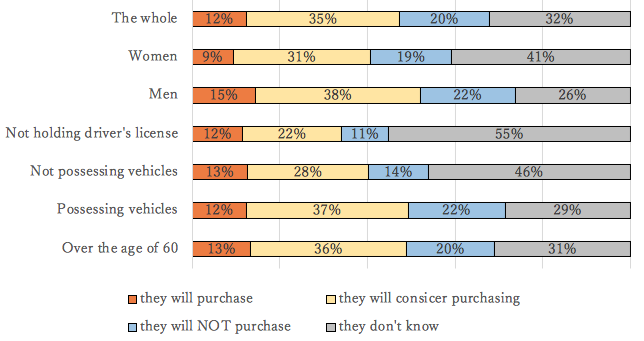 Men were more inclined to purchase, but the intention to purchase did not significantly vary with age. Respondents who did not own a car or did not have a driving licence had lower purchase intention than car owners, but more often responded that they did not know their purchase intention. Figure 2 shows the result of willingness to pay for FADs by consumer characteristics. While respondents without a driving licence had a lower intention to purchase, they would be willing to pay more for FAVs. 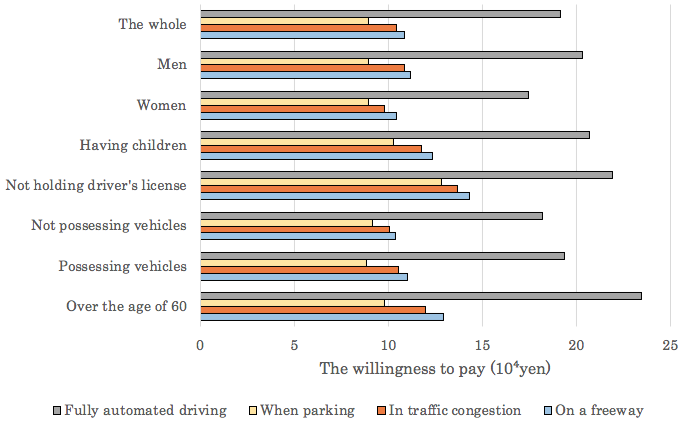 This implies that respondents without a license were polarised: either they were uninterested in technology and unwilling to pay for it, or very interested in purchasing FADs and willing to pay much more than average drivers. Men had a higher willingness to pay than women but, in contrast, to the purchase intention results, the willingness to pay of older respondents was significantly higher than average. This result may be partly due to this group's expectations of the benefits of AD technology, and their relatively high household incomes. Our survey data indicated that the majority of consumers expected to use automated driving technology on freeways and general roads. According to the survey data, willingness to pay for FADs as an additional function was approximately 190,000 yen ($1,650). We found a strong positive correlation between the intention to purchase and willingness to pay. The respondents who would purchase FADs when available had an average willingness to pay of 285,000 yen ($2,480), and respondents who would consider purchasing would pay 225,000 yen ($1,960) on average. On the other hand, the willingness to pay of respondents who would not purchase FADs was 134,000 yen ($1,165). Thus, consumers with the strongest purchase intention had a willingness to pay twice that of consumers with no interest in purchasing FADs. Given the price of partial and fully automated driving vehicles, BCG (2015) estimated prices for partial automated driving vehicles and FADs at approximately $2,000-$5,700 and approximately $9,800, respectively. So there is still a significant gap between the willingness to pay of consumers, and the forecasts of the prices they would pay. not needing a driving licence. Elderly people seemed to be highly interested in FADs – they selected more merit and demerit options than other groups. Our results indicated that merits mainly affected acceptability positively, and demerits mainly affected acceptability negatively. Considering that people who did not have cars or licenses were more willing to accept automated driving than people who did, we anticipate the expansion of usage will be for people without cars. We also found that municipality-level variables such as average tax income, share of elderly people, and average ratings of municipal services, as well as average life satisfaction ratings, did not affect consumer demand for FADs. There were significant effects on both individual analysis and regional analysis related to traffic accidents. Furthermore, it is clear that inner-city areas, particularly in Tokyo, had a higher acceptability of automated driving technology than other areas. Closing the gap between the price that firms expect and the price that consumers are willing to pay. Addressing the issue of possible technical malfunction. The first problem may be resolved through subsidies either to the industry or to consumers, and also by inventing to reduce production costs. To solve the second and third issues, investment in technological development would be useful. Sharing information about technological advancements and the merits of automated driving technology with consumers may also be effective. Editor’s note: The main research on which this column is based first appeared as a Discussion Paper of the Research Institute of Economy, Trade and Industry (RIETI) of Japan. Payre, W, J Cestac, and P Delhomme (2014), “Intention to use a fully automated car: Attitudes and a priori acceptability”, Transportation Research Part F: Traffic Psychology and Behaviour 27: 252-263. Shin, K J and S Managi (2017), "Consumer Demand for Fully Automated Driving Technology: Evidence from Japan," RIETI discussion paper 17-E-032. Managi, S (ed.) (2018), Economics of Artificial Intelligence, Minerva Publishing.